Woul´d be really great if you can help me with the dimensions! Do you perhaps have a drawing or...? I also bought bigger main jets (110), i will try them asap. 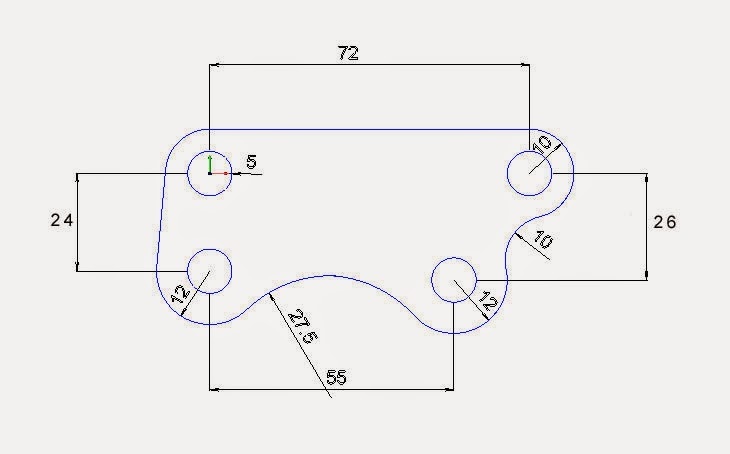 Here is a drawing of the caliper plate, the curve goes against the caliper and I think the spacers were made from ally and were 24mm thick by 24mm Dia. Picture too of the machined parts. Good luck, let me know how you get on. Just read on Bike EXIF that you lowered the front fork by 50mm. Now I am curious how you did that. So far I couldn't find any fork lowering kits for the GS550. Do you have any tips or instructions for this upgrading? As far as I know there are no lowering kits, but its dead easy, remove the damper rod and put a spacer behind the damper spring of whatever length you want to lower it by. I just used some old handlebar tube which was a perfect fit (7/8") and machined the ends square. You will have to remove the same amount from your spring ( I did it from the short rebound spring) unless you want serious preload! which with the GS, you will have to cut it (use a grinder cut-off wheel), you could try say 10mm at a time until you reach the tension you want, but you will have a hard job getting the fork nut back on, a friends help is always welcome. To show you what I mean, here is a vid I found of Ryca doing just this (but on a different bike, principal is nearly the same), but seems they didn't cut the springs as I guess the LS650 is a soft as the proverbial! That looks a real nice build, high quality!!! It looks like you have, pardon me for saying it, cheap Emgo type filters, not used them before but many have not had a great deal of success with them, best to get the real K&N's then you know its good!!! Get RC-0884, its a kit that includes 2x K&N part # 0880 and 2x RC-2620 so the outer ones are shorter and don't hit the frame. I have a supertrapp muffler on mine, so all in all my settings will probably be different. I've been struggling to find a set of those stubby K&N filters for my 1980 GS 550 with the Mikuni carbs. I think they have a 52mm OD. I don't suppose you know the K&N part number for those?! I've had to settle for foam Pipercross filters for now! Measure the OD with a vernier, then look on the K&N website, but be careful as the ones listed for my model DO NOT FIT properly and the ouside ones hit the frame, 52mm sounds mighty big, but then mine are completely different carbs, not sure that pods work well on those CV carbs either. I had to dig around the forums to eventually find the correct set. The GS Resources forum is good too as they are pretty much GS only. Outstanding bike Mad Ratter! So good in fact I just picked up a gs550 as my first project bike (currently stripped and in several boxes) and if I can get it looking half as good as yours I will be extremely happy! Just a couple of questions, did you powder coat the forks or are the bits just painted? Also I plan to upgrade the ignition as well, did you use the original coils in the end or did they have to be upgraded? My next step to see what the condition the tank is in as I plan to go the bare metal route (still need to work out how to best finish that without rust appearing). Hi, its a nice build. Inspiration to my own GS500 project, which is on a low budget. But what I dont really understand is the lowering on the forks, or is mine so different in steering geometry? Mine overstear a lot, lowering front shouldnt improve that, or do I miss something?